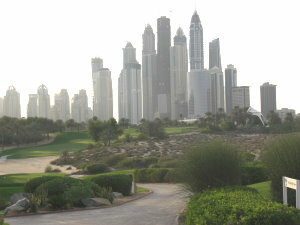 The Emirates Golf Club is the green pearl of Dubai. Your arrival at the Arabic style Club house, built in desert tent architecture, is the start of something very special. The reception is generous and friendly. Via a spiral staircase you reach the pro-shop downstairs on the left side and on the right you can enter the open but still exclusive club restaurant. TV screens keep you up to date and demonstrate the clubs focus on international sport. You can permanently follow the golf professional scene throughout the world. 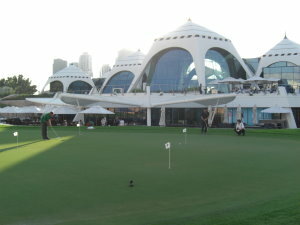 The Emirates Golf Club is part of this professional scene at least twice a year, hosting European Tour events for male and female pros from all over the world. Offering 36 holes to their members and outside guests, the prestigious tournaments are played on the Majilis course, the first course built in Dubai. With our visit overlapping the celebration of the 40th union day of the UEA and a tournament in full swing on the Majilis we took the opportunity to play the Faldo course, the Emirates second golf course. An excellent design by Faldo showing a great mix of sand, water and green surfaces. 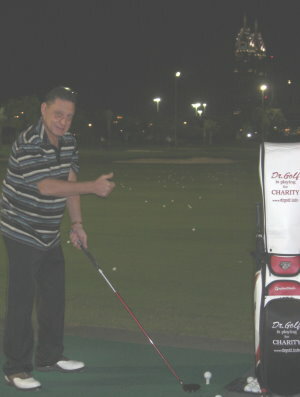 Surrounded by the bright illuminated skyline of Dubai and the floodlights of the golf course our golf game became something very special. My playing mate, Peter Siebenborn, was in top form. By nature a night person the dark circumstances appeared ideal for Peter. With his concentration focused on the ball the outcome was outstanding. Peter liked these conditions so much that from now on he wants to play only at night and if we can’t find a course with floodlights he will play in his dreams until we do. The buffet offered in the club house after our game was delicious and became a further highlight that can be recommended to all visitors.